A five-wicket haul by Tyrone Kane has given Ireland A control of their match against Gloucestershire Seconds in Bristol. The Merrion all-rounder took 5 for 37 as Gloucestershire threw away a good start, collapsing from 81 for 0 to 213 all out. Will Tavare (39) and Ian Cockbain (36) opened for the hosts, but after their bright start, were both accounted for Craig Young (3-70) just before lunch. Kane then ripped through the middle order to give the Irish the advantage, with Instonians' Nathan Smith also chipping in with two wickets. South African Calvin Harrison (44) added some late runs, but Ireland would have been happy with their afternoon's work. Stephen Doheny and Jack Tector (13) added 51 for the first wicket before skipper Tector was dismissed. James McCollum, James Shannon, and Aaron Gillespie all went cheaply, but Doheny remained solid to finish the day unbeaten on 46, joined by Lorcan Tucker (15*) in the Irish total of 146 for 4. The Irish were boosted by the concession of no fewer than 67 extras - which included 30 byes and 26 no-balls! "Under foot conditions were very difficult in the morning so it was tough for the bowlers," said Tyrone Kane afterwards. "It was a good wicket, with the Duke ball swinging as it usually does. Craig Young came on and got two quick wickets before the lunch break which made it an even session. "I changed ends after lunch and found my rhythm straight away grabbing 3 in 3 overs after the break. Jack Tector backed me up as skipper and allowed me to bowl a longer spell than normal and hopefully I rewarded that faith with four in the session. Getting the fifth just after tea was the icing on the cake. "Stephen Doheny is playing beautifully to be not out 46 over night so it�s a matter of applying ourselves and hopefully building a lead in the first session on Thursday morning ." It's been a great few days for Kane, who lifted the title with Merrion on Saturday, before playing a starring role as Leinster bounced back to beat the Warriors. "Yes, it's been a very strong finish for me. I was very happy to get runs for the Lightning on Sunday which gave me confidence coming into this week." Kane is one of a number of Irish players heading to Australia over the next few weeks, where he has played successfully over the past few seasons. Ireland A Head Coach Pete Johnston was happy with the day's work, but admitted there was room for improvement second time around. "Despite a very good afternoon session with the ball, we failed to capatilise with the new ball this morning, granted conditions were tough going with a wet outfield and Craig Young did pick up two timely wickets before the lunch break, but we will be looking to start better in the 2nd innings. 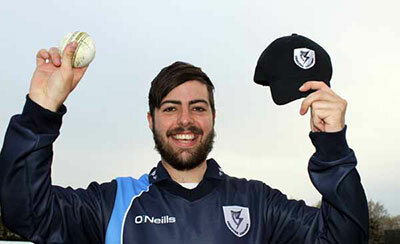 "Credit to Tyrone Kane who thoroughly deserved his five wicket haul with a challenging and disciplined performance. "Stephen Doheny batted well through the evening session and 3 of the 4 wickets we lost were to good deliveries. Hopefully the guys can start afresh in the morning, with a lot of time still in the game, there is an opportunity to build a good lead."